Taking advantage of a powder day in Colorado requires specialized gear—for humans, anyway. Lynx have it easier. Naturally tricked-out to thrive at high altitudes, the medium-sized wildcats come equipped with large hind feet that act as snowshoes. Winter recreationists and lynx utilize the same snowy spaces in Colorado’s coniferous high-mountain habitats. Does one influence the other? Maybe. The United States Forest Service, in collaboration with Colorado Parks and Wildlife, launched a first-of-its-kind study in 2010 with the goal of understanding how winter recreation could impact the threatened Canada lynx. The study was particularly novel because it recruited skiers, snowboarders, snowshoers and snowmobilers to carry GPS units while they recreated. Their movements would be compared with the respective movements of 24 lynx outfitted with GPS collars. Areas covered included the Vail Pass Winter Recreation Area and locations near Silverton, Leadville, Telluride and Summit Country—including Copper Mountain, Breckenridge, Keystone, Loveland and Arapahoe Basin ski resorts. Volunteers put down nearly 4,400 sets of human recreation tracks since the start of the study, and the research team is set to begin analyzing results. “The findings could help management agencies continue to provide recreational opportunities without harming wildlife,” says Jake Ivan, Colorado Parks and Wildlife researcher and study collaborator. Trapping, poisoning and loss of habitat led to the virtual disappearance of lynx from Colorado. In 1999, Colorado Parks and Wildlife began the reintroduction of 218 individuals to the state, pronouncing the effort a success in 2010. 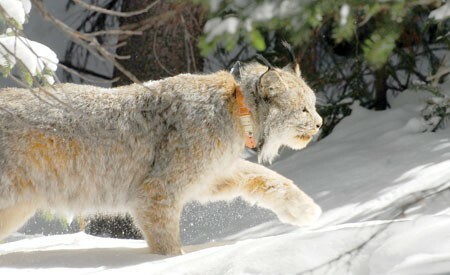 Lynx rely on lodgepole and spruce-fir forests with an abundance of their primary food source, the snowshoe hare. “They are very strictly tied to specific habitat and don’t have a lot of options to go other places,” says John Squires, research wildlife biologist with the Rocky Mountain Research Station and co-principal investigator of the study.